U.S. spies in Afghanistan need to learn more about the country's people and culture, the top intelligence officer says. Washington (CNN) -- U.S. spies "can do little but shrug" when commanders ask for the information they need to fight the Taliban insurgency, the top U.S. military intelligence officer in Afghanistan said in a blistering report. His report comes out less than a week after seven CIA officers and a Jordanian intelligence agent were killed by a double agent who set off a suicide bomb inside their base in Afghanistan. But the report is about military intelligence gathering, not the CIA's work, one of Flynn's co-authors, Marine Capt. Matt Pottinger, told CNN. "Our timing was independent of the tragic event in Khost Province," he said, referring to the attack that killed the CIA officers. Flynn co-wrote the report with Pottinger and Paul Batchelor of the Pentagon's Defense Intelligence Agency for a Washington think tank, the Center for a New American Security. Flynn's boss, Gen. Stanley McChrystal, the top U.S. commander in Afghanistan, backs the report, a spokesman for U.S. forces there told CNN. "We support this kind of activity. Gen. McChrystal is looking for ways to make things better," Adm. Greg Smith said. But Pentagon spokesman Bryan Whitman said it is "a bit irregular" that a report of this kind would come out through a think tank. "I think it struck everybody a bit curious," he said. "My sense is this was an anomaly and we won't see it again." He said he was not sure Secretary of Defense Robert Gates had seen the report, though he had been provided with a copy on the day of publication. "The most I will say is that it was an unusual and irregular way to publish a document," Whitman said. The report said some good work is being done on the ground, and that local intelligence officers "know a great deal about their local Afghan districts." But, the report said, they "are generally too understaffed to gather, store, disseminate and digest" information. And, critically, they do not have the resources to gather information which could give Americans a better understanding of Afghanistan, such as census data, patrol debriefs, minutes from councils with local farmers and tribal leaders, polling data, translated summaries of radio broadcasts that influence local farmers and the like. "This vast and underappreciated body of information.... provides... a map for leveraging popular support and marginalizing the insurgency itself," Flynn and his colleagues argue. As a result, "U.S. intelligence officers and analysts can do little but shrug in response to high level decision-makers seeking the knowledge, analysis and information they need to wage a successful counterinsurgency," they say. 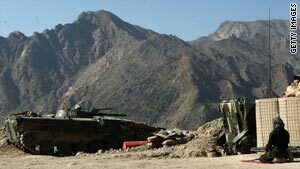 The report claims they cannot answer basic questions unrelated to the military fight against the Taliban, such as: "Is that desert road we're thinking of paving really the most heavily trafficked route? Which mosques and bazaars attract the most people from week to week? Is that local contractor actually implementing the irrigation project we paid him to put into service?"